A few years ago, I began inviting hosting scientists, engineers, doctors, and other experts to my blog to discuss their subject of expertise as it applies to science fiction and fantasy. I had no idea that the blog series would go on to collect over 150 articles, or that we’d develop it into a book with Writer’s Digest. 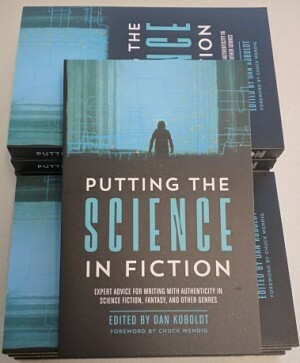 Putting the Science in Fiction was published last month. Since it’s the last week of NaNoWriMo, I thought I’d recap some highlights from our book’s first month in the world. If you’ve read Putting the Science in Fiction, reviews on Amazon, B&N, and Goodreads would be deeply appreciated! My contributors and I did some in-person events during release month to help spread the word about our book. In early October I went to New York Comic Con for a panel and book signing with Chuck Wendig. Contributors Anne Lipton and Matt Perkins sold out of their signed copies at the Surrey International Writers’ Conference. I also got to live out my dream of an event at the fabled Mysterious Galaxy bookstore in San Diego along with contributors Danna Staaf, Gwen Katz, and Amy Mills. We held a lively panel on the science of science fiction and signed plenty of books. My favorite thing about this book are the ~40 contributors who’ve worked on it with me for the past year and a half. All of them were eager to help share it with the world. With so many experienced bloggers, we naturally thought of a blog tour. However, we wanted to give it a new spin and provide some inspiration to the writing community. We came up with the Sci-fi Story Prompts blog tour. Every Monday, Wednesday, and Friday, a contributor shared a bit about his or her expertise and some related story prompts as inspiration for #NaNoWriMo. The good folks at NaNoWriMo even let me share some advice on researching your writing on the NaNoWriMo blog. There was a giveaway, too, of ten copies of the book signed by yours truly. I loved all of the story ideas and hope they inspired some NaNoWriMo projects. WD hired an external publicist, Lisa Sweet, who coordinated a lot of the pre-publication publicity like my LitCast conversation with Publishers Weekly. Undoubtedly our biggest media exposure so far was the interview with CNET that was published as “The science of Star Wars, Spider-Man, Avatar debunked by actual scientists.” Although the title was a bit more sensationalist than the interview content or the book itself, it certainly got a lot of attention. More media requests came, including a discussion with Rick Liebling for his Adjacent Possible column on Medium. Some well-established authors were generous enough to host a guest post from me on their blogs. I discussed writing realistic science fiction on John Scalzi’s Whatever, and balancing research with writing on the blog of publishing guru Jane Friedman. I also shared some of the creepy and/or horrifying things I learned while editing the book on Chuck Wendig’s Terribleminds. The latest bit of good news about our book came this week, when we were able to announce that Tantor Media bought the audio rights for Putting the Science in Fiction, including the foreword from Chuck Wendig. The folks at Tantor Media have been fabulous to work with so far — they’ve already lined up some amazing voice talent to narrate the book — and I’m confident they’re going to produce a great audiobook. Share it with your real-world or online writers groups. They can read a sample here. Give the gift of PSIF to the writer in your life.